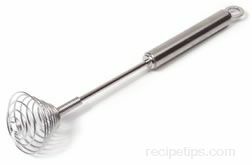 A mixing utensil that is best used to whipping eggs, blending sauces, and smoothing gravies. 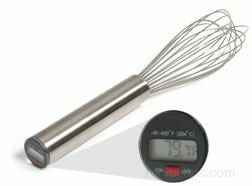 The head of this whisk has a set of wires that are coiled in a circular, spring-like pattern that allows the head to move up and down while ingredients are stirred or blended. The up and down motion serves to act as another mixing action to thoroughly blend the ingredients. When selecting, make sure the whisk has a sealed surface where the wires enter the handle, to keep food from accumulating in hard to clean areas.